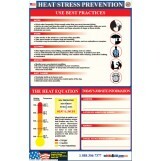 Heat stress injuries are continually one of the most pervasive, preventable conditions in the workplace today. Especially common in Construction sites during the Summer months heat stress can take the form of heat rash, heat cramps, heat exhaustion and heat stroke, each more severe than the previous. Heat can also increase the risk of injuries in workers as it may result in sweaty palms, fogged-up safety glasses, and dizziness. Burns may also occur as a result of accidental contact with hot surfaces or steam. Workers at risk of heat stress injury include outdoor workers and workers in hot environments such as firefighters, bakery workers, farmers, construction workers, miners, boiler room workers, factory workers, and others. Workers at greater risk of heat stress injury include those who are 65 years of age or older, are overweight, have heart disease or high blood pressure, or take medications that may be affected by extreme heat. Workers at risk of heat stress injury include outdoor workers and workers in hot environments such as firefighters, bakery workers, farmers, construction workers, miners, boiler room workers, factory workers, and others. Workers at greater risk of heat stress include those who are 65 years of age or older, are overweight, have heart disease or high blood pressure, or take medications that may be affected by extreme heat. Those workers that are involved in construction jobs in locations where temperatures routinely go into the 90s and 100s are especially susceptible, also. 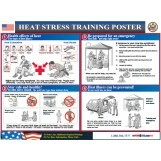 OSHA has published a full guide on combating and coping with heat stress in all situations, but particularly in those that work outside in oppressive heat. 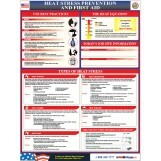 The CDC/NIOSH also have recommendations for the control of Heat-Stress injury, both using engineering solutions as well as work-practice suggestions. 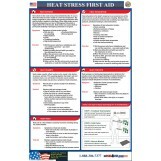 We also provide posters that can be used to raise awareness and guide steps for first aid if someone shows signs of heat-related injury. Take a look at our posters below and purchase at our discount rates!